rjvbb added a comment to D20400: Karbon: Enable multi page capability. rjvbb added a comment to D18380: KIO: make file dialog columns resizable again (and movable). rjvbb added a comment to D19283: try to improve painting height for text lines - bug 403868 avoid to cut _ and other parts still broken: double height things like mixed english/arab, see bug 404713. I would rather keep the current behavior and let people use sane fonts if the want unicode. FWIW, Calligra Words can (idem QWE and QWK) so I guess you mean KTE cannot without a complete rewrite of how text is displayed? Just load the XML file from bug 404713. Before this changes here, you did overpaint the next line randomly with the "oversized one", now you "cut" the oversized line. So it seems that the partial revert works; you lost me re: what would break again by doing that? We just can't use one fixed height for such texts. That is a good observation: @cullmann Could you give this partial revert a try? rjvbb added a comment to D19416: Restore the search wrapped message to its former type and position..
@loh.tar The line edit in the search bar was once used before the floating message widgets in the view even existed. I guess it's legacy and possibly can be removed? Next Frameworks Tag is on Saturday, 2nd, i.e. in 2 days. Revert, or give it a try? rjvbb requested review of D19416: Restore the search wrapped message to its former type and position..
rjvbb added a comment to D19216: Karbon: Enable multi page capability. That is actual a valid point, although in say Krita with transparent pixels a checkerboard is shown. No, the canvas is part of the document and must never be themed. The canvas background is as much part of your drawing as any line you put on it. rjvbb added a comment to D18229: Contextbrowser: Ability to show combined problems and decl tooltip. Even in your screenshot it looks fine to me. About the combined popups: could you downsize the 2 components so they always have the same (reasonable) size which could be coupled to screen height? Omitting the problem tooltip if it's large makes it a bit unpredictable to the user. He/she then won't know in advance whether hovering over a location that might show a combined tooltip will actually show it or not. I don't quite see what it is for. You can set a background color for the canvas but it is only for the views, it is not printed. This seems like a big productivity progress (can't test it yet because using the 5.3 branch) but I have a concern that it is only a sufficient solution for those of us with (very) big screens. Esp. problem reports can be long, and I've never seen a scrollbar in them, AFAICR. Another concern is that the combined popup might be so big it's going to obscure parts of the code you'd want to keep visible for context. This would indeed be great to have; even a page selector when importing a multi-page document would be an improvement (the Adobe Illustrator version I've use had that; IIRC it would just leave all other pages of the document alone). rjvbb added a project to D9006: KDevelop project file manager: watch directories exclusively, avoid concurrent reloads and represent jobs in the RunController (PoC): KDevelop. rjvbb updated the diff for D9006: KDevelop project file manager: watch directories exclusively, avoid concurrent reloads and represent jobs in the RunController (PoC). Time to rebase this proof-of-concept and restore its full scope, for reference even if only parts ever get upstreamed (there was a blocking disagreement last time). rjvbb added a comment to D11934: KDevelop : "Reparse Entire Project" action in the project manager context menu. This patch also changed the logic of openProjectConfig(). rjvbb added a comment to R32:4ae0f487b931: "Reparse Entire Project" action for the ProjectController. rjvbb committed R32:4ae0f487b931: "Reparse Entire Project" action for the ProjectController (authored by rjvbb). rjvbb closed D11934: KDevelop : "Reparse Entire Project" action in the project manager context menu. What's the minimum viable change here? rjvbb added a project to D11934: KDevelop : "Reparse Entire Project" action in the project manager context menu: KDevelop. rjvbb updated the diff for D11934: KDevelop : "Reparse Entire Project" action in the project manager context menu. 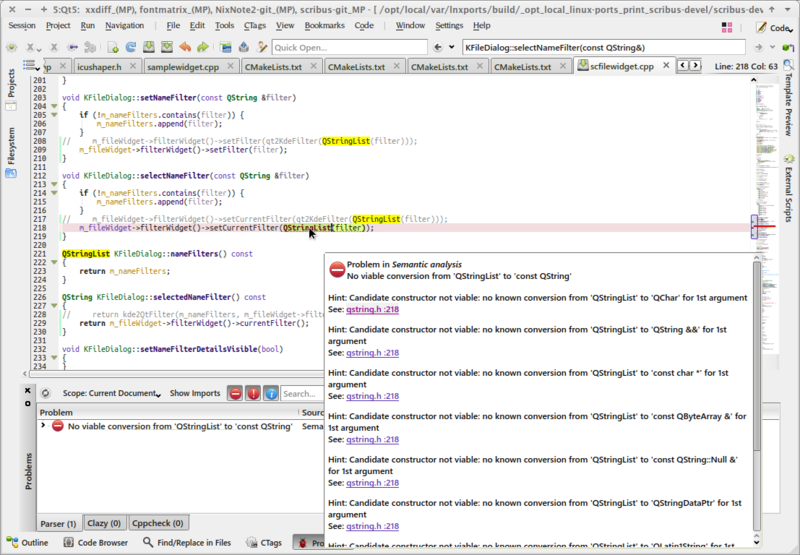 rjvbb added inline comments to D11934: KDevelop : "Reparse Entire Project" action in the project manager context menu. rjvbb committed R32:fba39d4a06a4: Don't call clear() on a shared pointer we don't own (authored by rjvbb). So this is just going to become a victim of the better-is-the-enemy-of-good principle? rjvbb added a comment to D7930: Kdevelop CMake plugin : use canonical paths to build.dir. rjvbb set the repository for D11934: KDevelop : "Reparse Entire Project" action in the project manager context menu to R32 KDevelop. Updated as requested (minus the potential change to iProjectController::reparseProject). rjvbb set the repository for D15530: kdev-clang : somewhat more complete ObjC(++) support to R32 KDevelop. rjvbb updated the diff for D15530: kdev-clang : somewhat more complete ObjC(++) support. rjvbb added inline comments to D15530: kdev-clang : somewhat more complete ObjC(++) support. 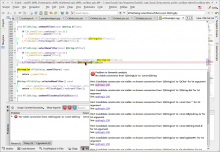 rjvbb abandoned D14469: KDevelop: word wrapping the problem text in the Problem Reporter (WIP). rjvbb set the repository for D16894: [ECM] use a macro to add compiler flags conditionally to R240 Extra CMake Modules. rjvbb updated the diff for D16894: [ECM] use a macro to add compiler flags conditionally. Now tested more exhaustively and with unittest. rjvbb committed R626:25c45221b66c: move initFontTickData into Style (authored by rjvbb). rjvbb committed R626:293a822b2fc0: Fix the LibreOffice fix (authored by rjvbb). rjvbb committed R626:ef1e350efa49: work around a crash in LibreOffice (authored by rjvbb). rjvbb added a comment to D14469: KDevelop: word wrapping the problem text in the Problem Reporter (WIP). What I meant is that tooltips in the problem reporter appear when you hover the mouse over an entry, and disappear again when you move the mouse back to the text editor (and certainly when you need to scroll the editor window because the tooltip covers the area where you need to be). But for some reason I'm not getting any tooltips in that reporter at all at the moment. rjvbb added a comment to D16894: [ECM] use a macro to add compiler flags conditionally. So according to you, this line is useful ? from my point of view, it's needless and just looks like a syntax error. rjvbb committed R8:2c601b660e88: QMainWindow::setUnifiedTitleAndToolBarOnMac should not be used anymore. (authored by rjvbb). QMainWindow::setUnifiedTitleAndToolBarOnMac should not be used anymore. There are tests for other ECM modules in the **tests** subdir. rjvbb added inline comments to D16894: [ECM] use a macro to add compiler flags conditionally. Right, but I was saying all this because I think IF_SUPPORTED (the keyword in the arguments) should be SUPPORTED_IF. rjvbb added a comment to D15797: [kdev-clazy] : use canonical paths. I really can't remember if I had a specific reason or if this is just the result of a search/replace. This follows David's suggestion, but using QUERY_IF instead of the suggested TRY_IF to make it clear that this parameter controls the querying of the compiler. I haven't yet tested the new logic exhaustively but the as far as I can tell the macro behaves as intended as used in the two compiler settings modules. Usually if you have a conditional behaviour the associated condition specifies when to trigger it, no? You're right that the names don't suggest exactly how the condition is being evaluated (with extra checks or not), but that was also a bit the idea. Don't bother the user with such details, just provide a macro that will add the flag(s) if they are supported, with an optional conditional expression that can make things faster. Renamed macro and parameter names as announced in my last comment. This makes sense to me. Just the name "SUPPORTED_IF" is strange, when reading that, one thinks "well, if we know the compiler flag is supported, why are we testing that it is?". rjvbb added a comment to D18547: Don't enable -Wzero-as-null-pointer-constant on apple clang. But still, isn't there another way? Now the header and view are locked together. One doesn't work without the other. rjvbb accepted D18551: clang: Create preamble only on second parse. rjvbb committed R32:a7c053a39218: kdev-clazy: use canonical paths (authored by rjvbb). rjvbb closed D15797: [kdev-clazy] : use canonical paths. This is in fact cmake's fault, or ECM's for not taking a cmake quirk into account. rjvbb requested changes to D18547: Don't enable -Wzero-as-null-pointer-constant on apple clang. See also https://phabricator.kde.org/D16894 which (initially) aimed to tackle this in a more general fashion.